because I'd actually purchased a bin of Legacy Foods off Amazon the other week. Not because I was fearful of our political future, but because our family has been getting ready for The Big One. 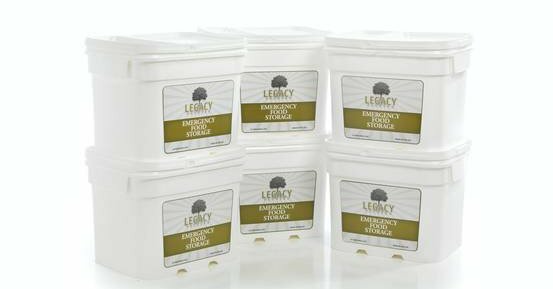 As a fresh and homemade food fan, a bucket of freeze-dried entrees is far from appetizing, but fresh and homemade food might be hard to come by in the aftermath of a big event. The City of Bellevue advises having five days' worth of food on hand, but I've heard numbers up to two weeks. Seriously, folks, if the Big One hits this winter and you haven't yet formalized your plans to emigrate to Canada, damaged roads and infrastructure will make it difficult to walk there, much less drive there. At first I thought I'd stockpile canned food, but the options for canned are pretty limited. How many times do we want to eat oversalted chili and soup varieties? Canned foods also weigh a ton and take up tons of room. So, freeze-dried. But remember--if you buy freeze-dried, you're going to need water. Lots of it. But, in addition to hating pre-processed food, I'm anti plastic water bottles. And how many little water bottles will it take to rehydrate entrees for a family of five and however many neighbors show up? Therefore you need a volume water filter. Something that can handle water you might find anywhere: in the Lake, in the creek running behind your house, in a standing pool in your yard. So, if you're freaking out because Donald Trump was elected, channel your fear into disaster preparedness this week. And if you're pleased as punch by the voting results, celebrate by preparing for the Cascadia earthquake, an event as unpredictable, it seems, as American elections.